My experience attending the St. John Bosco Conference at the Franciscan University of Steubenville did leave me with one lingering question prompted both by the content and methodology employed in some of the presentations. Namely, I went home wondering if there isn’t a danger in becoming overly reliant on the Catechism of the Catholic Church as a source of the Church’s teachings. To give an example: I attended a session on liturgy and catechesis given by a well-respected catechist. He outlined the Church’s understanding of liturgy, beginning with the maxim lex orandi, lex credendi. But in his presentation and handouts, every reference was to what the Catechism had to say about liturgy. He did not reference the Roman Missal , Sacrosanctum concilium , the General Instruction on the Roman Missal , or any of the Church’s many documents on the nature and practice of the liturgy. The implication — intentional or not — was that everything we need to know about liturgy can be found in the Catechism . There was little “liturgy” to be found in the presentation. Contrast this approach with that taken by Bishop Richard Malone at the start of his Saturday keynote. His topic, God the Father, was not explicitly tied to the liturgy. Indeed, one might have expected him to use as his starting point the Catechism‘s teaching on the first person of the Trinity. Instead Bishop Malone turned to the Roman Missal and the prefaces to the Eucharistic Prayers to show what they teach us, through our common prayer, about the Father. He didn’t talk about lex orandi, lex credendi — he practiced it by showing how our prayer leads to and informs our doctrine. The Catechism of the Catholic Church … is a statement of the Church’s faith and of catholic doctrine, attested to or illuminated by Sacred Scripture, the Apostolic Tradtition, and the Church’s Magisterium. I declare it to be a sure norm for teaching the faith and this a valid and legitimate instrument for ecclesial communion. In other words the Catechism is not the last word on the content and expression of the Catholic faith. It is a statement and a norm, not the sole source. That is one reason John Paul II stresses the continued importance and prominence of local catechisms such as the United States Catholic Catechism for Adults and the YouCat . These local catechisms enculturate the content of the Catechism by giving it new expression in local language and form. This isn’t to say (it should go without saying) that the Catechism isn’t helpful or shouldn’t be used in catechesis. Indeed, a universal catechism should have a place of prominence in the handing on of the faith. But there does seem to be an overly didactic tendency in some catechists that a fixation on the Catechism feeds into. This tendency manifests in claims that the Catechism is the only authentic source of Catholic teaching, rather than a summary of it, and an insistence that the language used in the Catechism is the only authentic expression of the Catholic faith (an insistence that neglects both Church history and the rich tradition of the Eastern churches). That this question was prompted by the conference is ironic since on at least two occasions I heard different speakers warn against didacticism in catechesis. Indeed, I don’t want to give the impression that the conference or any presenter specifically endorsed sole reliance on the Catechism . But the fact that the only document quoted by a good number of presenters was the Catechism does give me pause and makes me think that we are not giving our catechists the full range of tools they need to pass on the faith. I’d love to hear others’ thoughts in the comments. Do you sense this same creeping didacticism? How can we help catechists embrace a wide range of sources of Catholic teaching? Our diocese is in the process of establishing curriculum standards for religious education in Catholic schools and parish-based programs for children. It’s been a fun — and challenging — task that still has at least two years to go. Our committee has wrestled over not just what should be included in a comprehensive curriculum for discipleship, but also how to phrase teachings in age appropriate ways that are faithful to the Church’s tradition. In the process my respect for the Catechism of the Catholic Church has grown considerably — not so much for it’s organization or content (which I’ve appreciated for some time), but for the way in which it takes heavy theological and spiritual concepts and makes them accessible. Far from the weighty, verbose reference it is sometimes made out to be, the Catechism is surprisingly readable for a Church document. I’ve also been impressed with it’s precision of language — something I strive for in my own writing. In fact, on several occasions we’ve been stuck for a phrase or word to describe a concept in our standards. Each time, when we’ve consulted the Catechism , we’ve discovered the perfect word already there. It’s a shame that more people don’t make use of this great treasury of the Church’s wisdom. It seems to me that many misunderstanding about the Catholic Church could be cleared up by focusing on what the Church herself says in the Catechism rather than what certain “experts” claim she says. None of this will be a surprise to those who are used to using the Catechism in faith formation, evangelization or apologetics. But as we observe the 20th anniversary of the Catechism ‘s promulgation on Thursday, let’s keep in mind just what a gift it has been in the life of the Church. From establishing a baseline for religious instruction to spawning local catechisms such as the United States Catholic Catechism for Adults , the Church’s catechetical ministry is much richer for it. And that’s worth celebrating. In case you missed it last week, the United States Conference of Catholic Bishops (USCCB) has released a new online version of the Catechism of the Catholic Church (CCC). This is something that has been a desperate need — while there have been work-arounds for making a robust online catechism available, having an official version from the bishops is a very positive step forward in the USCCB’s social media and technology initiatives. Is this version everything we could have hoped? No, but it’s pretty good. Here’s some specifics. 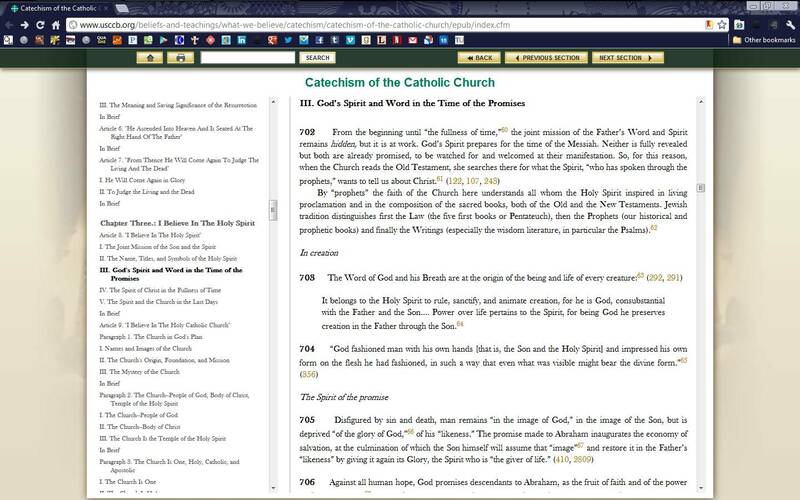 The online Catechism has a simple layout: a table of contents on the left, hyper-linked to the headings. It’s a pretty long list; a collapsible menu structure may have been preferable, but also would have made it harder to browse to find the section you’re looking for. A nice touch includes alphabetical links to sections in the Glossary and Index. On the right side of the screen is the text of the Catechism itself. It’s wide enough to be readable without onerous amounts of scrolling. The headers and paragraph numbers are set off from the text and in bold type, so they are easy to scan. All in all it’s a very readable presentation of the text. Of course there is room for improvement. I know it would have added work, but I would have loved to have seen the footnotes hyper-linked to their respective texts. At the very least the biblical citations should link to appropriate section of the USCCB’s online New American Bible — this would go a long way towards making a true online reference. Another major drawback is that, from what I can tell, there is no easy way to link to specific sections of the Catechism . Browsing through the Table of Contents doesn’t change the URL. You can right-click and copy the URL from the links in the Table of Contents, but that only takes you to the text of that particular section without the search bar or Table of Contents. Bloggers and other online evangelists will find it difficult to point people to specific citations; hopefully this feature will be added in a future update. The most important aspect of the online Catechism is its search capability. How does it work? Remarkably well! The search bar is always accessible at the top of the page and returns searches quickly. Ten search results are returned on the right, with two lines from the revelant paragraph displayed. Clicking on the title of the paragraph brings a popup with the whole paragraph and a “read more” link to the paragraph within the Catechism . The one drawback is that the search only recognizes whole words; “episco” won’t find any matches, but “episcopal” will. I hope this will be updated in a future version so that we can search for word roots as well as whole words. But that’s a pretty minor quibble. Of course, in today’s day and age, you have to develop for mobile. I checked out the online Catechism on my Motorola Droid Pro and my office’s iPad. The phone worked better than I expected. I oriented the phone in landscape and had to zoom into the right side in order to read the text comfortably, but not so much that it cropped the text on the left or right. The book looks great on the iPad in portrait but especially in landscape. I suspect that this will become my favorite way to access the site. That having been said, the fact that the Catechism still isn’t available as a standalone app is maddeningly frustrating, especially for those of us who live and minister in rural dioceses. When I’m in Quincy — one of the major population centers of our diocese — I have no 3G connection (thanks to Verizon’s less than stellar coverage) and so I have no way to access the Catechism in a parish unless they have wi-fi (which very few parishes do). There is a huge need for a completely downloadable Catechism app for iOS and Android that contains the layout and search capability of the online version. The new online Catechism can only be viewed as a stop-gap measure until such an app is available and I hope that the USCCB is working diligently and swiftly to make that happen. When I heard last month that the USCCB would be launching a new online Catechism of the Catholic Church (and has plans to launch the United States Catholic Catechism for Adults ) I was skeptical. I intentionally kept my expectations low so as not to be disappointed. Thankfully the USCCB has given a great resource that, while not perfect, goes a long way towards making the Catechism more accessible and user-friendly. A Catechism and New American Bible app — or better yet, making those texts available to app developers — must be the next step to truly make these foundational documents available to a 21st century audience.